Brand : Pure Baby Material : 100% Organic Cotton Size &.. Brand : Pure Baby Material : 100% Organic Cotton Color : Natural Cotton Colo.. 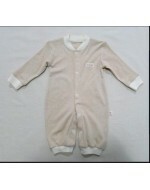 Brand : Pure Baby Material : 100% Organic Cotton (Top) & Natural Coloured Co.. Brand : Pure Baby Material : 100% Natural Coloured Cotton Size .. Brand : Pure Baby Material : 100% Combed Cotton Double Jacquard Size ..